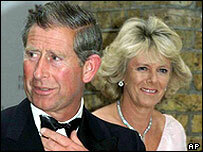 Prince Charles and Camilla Parker Bowles will acknowledge "sins and wickedness" at their wedding blessing. The prince will also pledge to be faithful to his new wife in the service at St George's Chapel, Windsor. The pair will join the congregation in reciting an act of penitence from the 1662 Book of Common Prayer at Saturday's service. Former Archbishop of Canterbury Lord Carey, who urged the couple to marry, will read at the wedding blessing. Actor Timothy West, a friend of the couple, will also read. Musician Jools Holland and comic Sanjeev Bhaskar will be among the 800 guests. The St George's Chapel service follows a civil ceremony in Windsor Guildhall. Lord Carey, who will read from the Book of Revelation, last year said in memoirs that he had counselled the prince over his relationship with Mrs Parker Bowles and said it would be the "natural thing" for them to marry. Timothy West will read William Wordsworth's Ode: Intimations of Immortality during the 45-minute service. The ceremony has been arranged in consultation with the Archbishop of Canterbury, Dr Rowan Williams, who will conduct the service. Prince Charles and the new Duchess of Cornwall will read the act of penitence which is worded: "We acknowledge and bewail our manifold sins and wickedness, which we, from time to time, most grievously have committed, by thought, word and deed, against thy Divine Majesty, provoking most justly thy wrath and indignation against us." Clarence House revealed that the postponement of the wedding from Friday, to avoid a clash with the Pope's funeral, meant 20 people could no longer attend the blessing. But four others were now able to make it, aides said. The Queen and the Duke of Edinburgh will be present, but are not attending the earlier civil ceremony. The Queen will hold a lunch for visiting foreign royals after the wedding.